Several photos and videos of Priyanka Chopra chilling with fiance Nick Jonas hit the Internet on Saturday. Priyanka Chopra stepped out in style for a lunch date with Nick in New York recently. Photos shared by the fan clubs features Priyanka and Nick twinning in black attires. 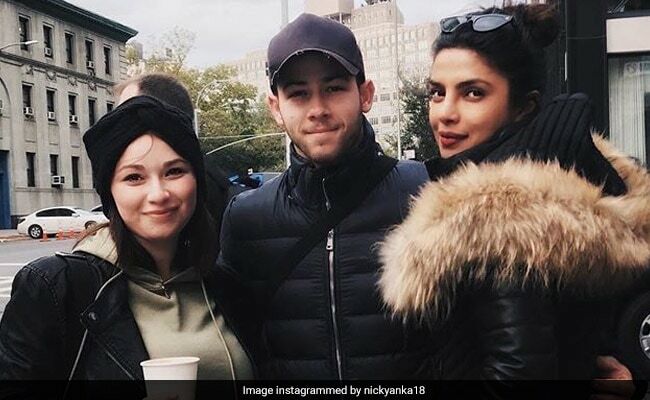 In one of the photos shared on the fan clubs, Priyanka and Nick can be seen posing for a photo with a fan while in the other picture the duo can be seen entering a restaurant in the city. Later, Nick and Priyanka were also spotted arriving at the Mean girls broadway show together. It was recently reported that Priyanka Chopra will be moving to Los Angeles after marrying her singer fiancé Nick Jonas. A Daily Mail report stated that the 26-year-old singer bought a lavish five-bedroom mansion in the Beverly Hill. Though Priyanka and Nick will initially move to Los Angeles, it may not be the actresses' permanent residence since she is always on her toes due to professional commitments. .
Priyanka Chopra got engaged to Nick Jonas on her birthday in July this year and formally announced their relationship after a roka ceremony, which took place in Mumbai in September. Priyanka and Nick are expected to get married in Jodhpur in December and the couple have zeroed in on Mehrangarh Fort as the venue for the pre-wedding functions. Reports suggest that the main event (wedding) will be hosted in Umaid Bhawan. On the work front, Priyanka Chopra is currently in the middle of filming Shonali Bose's The Sky Is Pink, co-starring Farhan Akhtar and Zaira Wasim.